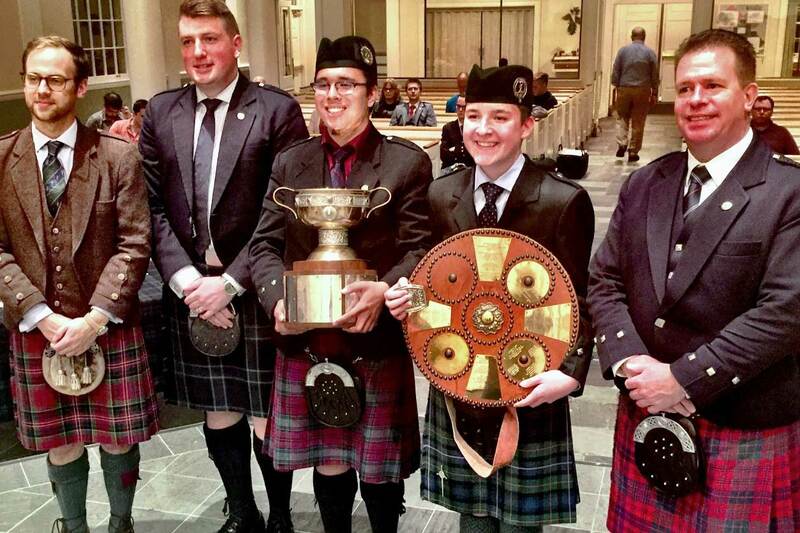 SFU piper Alistair Bevan (fourth from left) with his prize after taking two top solo prizes in a North American contest reserved for the top amateur pipers. SFU Pipe Band Pipe Major Alan Bevan is one of the world’s best pipers—and his son Alistair is proving he’s not far behind. Barely 15, he took two top solo prizes and placed second in a third at the 2017 Nicol-Brown amateur invitational piping competition in New York earlier this month. The contest—also won by his father in 1991—is for the top amateur pipers from across North America. Among his many prizes is a trip to London to compete at the Scottish Piping Society of London’s competition in November 2018. 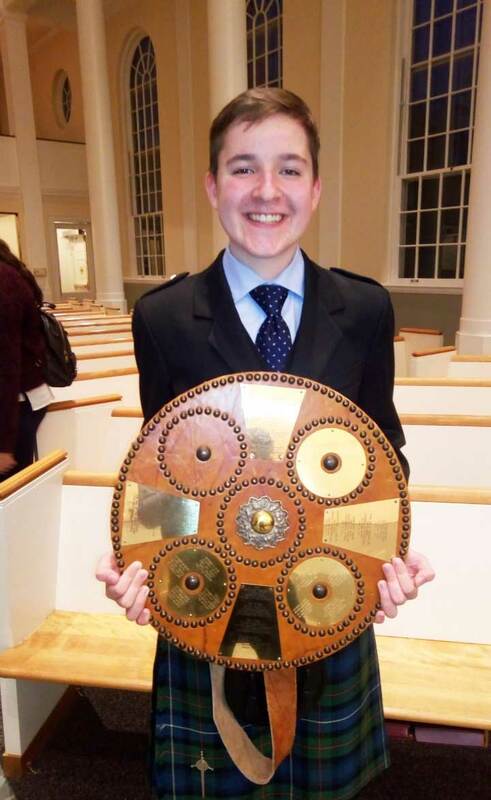 The young Bevan, one of two sons who have been involved in the SFU pipe band’s junior Robert Malcolm Memorial band (RMM), was recently elevated to the Grade 1 elite band. Alistair and younger brother Callum competed at the World Pipe Band Championships in Glasgow this past August as members of RMM, joining dad and mom Bonnie, who both competed with the SFU band. Like his dad, Alistair is making a name for himself in the world solo circuit. And now a Grade 1 band member, he will return to Glasgow next summer, this time side by side with his piping parents. The junior system has spawned many new talented pipers and drummers, serving as a feeder system for the senior band and providing young members with world-class piping and drumming instruction. Tori Killoran, who is also an acclaimed highland dancer, is another piper who has played up through the junior band system. She also competed at this weekend’s Nicol-Brown contest and placed fourth overall. Later this month, veteran piper Jack Lee, the Grade 1 band’s pipe sergeant, will play in the prestigious Glenfiddich piping championships at Blair Castle in Scotland, a contest reserved for the top 10 pipers in the world.